The aluminum dash I fabricated looked super fast, but the glare it created was super dangerous. I guess engine turned dashes look great on Hot Rods and Bentleys but not race cars. So, I primed and painted it flat black. Dash glare solved. Then I noticed that I had a pretty robust leak into the cabin. We have had so little rain in Denver that I did not notice it until recently. But it must have been happening for some time due to the surface rust that was created in side. 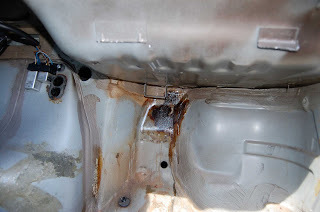 I traced the leak to the junction of the battery tray and the circular water outlet pipe. I dremeled the old body sealant out of the way and replaced it with some good 3M weatherstrip adhesive. 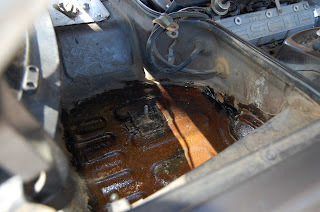 I then took the time to clean and POR 15 the battery tray and the inside area where the surface rust started. The clear shiny stuff in the pics in the POR 15. It drys to a shine. I also cleaned up the wires quite a bit more and cut off a bunch of not needed brackets. Not too bad for say 3 hours worth of work. Finally, a weekend with no work to do and good weather. Plus, my friend Chris Mosera who runs a cool production company called Garage Films is an auto racing nut, was in town and able to help me. Every project on a car goes like 3 times as fast with a helper than when you are by yourself. The first project was deleting the headlight motor assembly. Four bolts and a popping off a circlip and this was done. Next, was deleting the windshield washer reservoir. Two bolts and then you pull it out from the bottom. Yank out the lines and this was done. Now, the heater, not so easy. First, we needed to put in place a line that went from the water rail over the exhaust to the inlet on the manifold. It is a tight fight, and took some swearing to get the new 5/8 heater line to fit. Had to play with the length so it would not crimp. Longer was better. Now to remove the heater, you need to remove the dash. Jim Pasha has a good article on how to do this. Once the dash was out, we were able to get at the heater assembly. Four bolts on the firewall accessed from the engine and it drops out. I was going to reuse the dash but it is so ugly and cracked it was annoying. It is actually not that heavy. Maybe ten pounds. But I wanted to make a dash to hold the stock gauges. Luckily, I have a neighbor who is a metal artist and he let Chris and I use his shop. First, we made a template out of cardboard to make sure it would fit nice. Then, with access to some 16 gauge aluminum stock and a plasma cutter the dash was cut to size quickly. Finally, we bent some 1" metal stock for brackets. We left some room for a few additional gauges if I want to add them down the road. The dash weighs 1lb. The gauges themselves are very heavy though. Some big house clamps on the back of the gauges hold them in place. 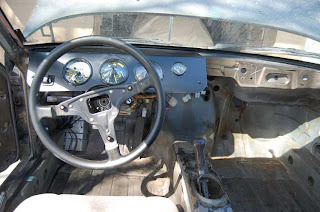 I moved the speedo to the left hand side of the dash, put the tach in the middle and rotated it so that the shift point was a twelve o'clock and then put the multi gauge in the right hand spot. Looks pretty sharp. Too sharp though as the reflection is pretty bad. I will probably just spray it flat black or glue a piece of black suede to the top of it. One small final thing was to make another aluminum panel to cover the whole left by removing the heater assembly. This was weather sealed and bolted in place. Wow. I am tired. And look at all the junk I was able to take out. Just sitting there on the ground. I've been beyond busy with my regular job so not able to work on my Porsches much. But, that does not mean I do not get the odd minute or two to surf craigslist. And what a gem I found that has been on the denver site for a while. 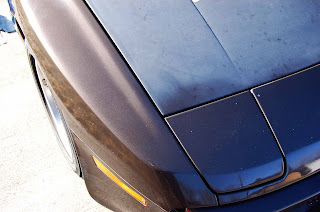 I have tried to get it posted on bringatrailer.com but they keep dissing it. 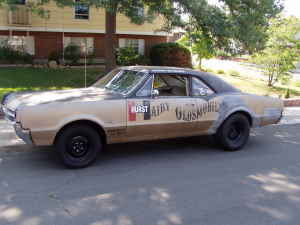 It is a 1966 Hurst Hairy Olds replica. 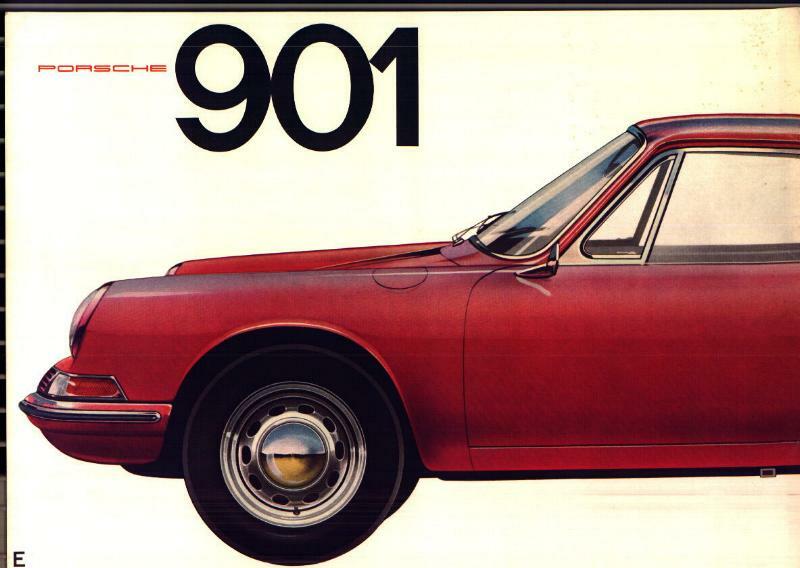 What is cool, is that it is not all shiny and new like most old-style replicas. They made it to look like a barn find. And anyone who reads this site or my book knows I love barn finds. Hopefully I will be able to do some dash stripping/rebuilding on the 944 this weekend. After getting an alignment at Eurosport I was finally able to have the Brown Bomber in a state of repair that I could take it to get an emissions test. 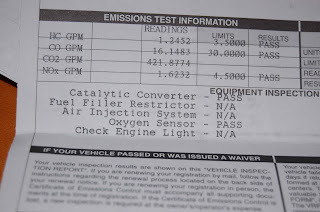 Since the guy I bought the car from did not need emissions in his county I was quite worried about the test. 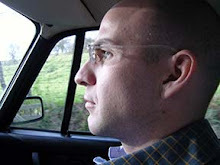 The last thing I wanted to do was splash out a few hundred dollars for a new Catalytic Converter that I would then take off the car so I could go racing. That would have blown more than private schooler in prison. 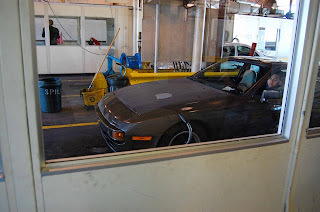 After reminding the emissions "tech" that the 944 is not a front wheel drive car the test was under way. And then it was over in a flash. 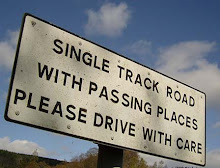 The car did not just pass. It "fast passed" in about 30 seconds with numbers well under the limits. So this bit of good news helped temper the realization that I need new tires, shocks and a radiator before I can take the car out and run it in anger. Or even mild annoyance. We Don't Need A Stinkin' Repaint. Oxidation Banished. 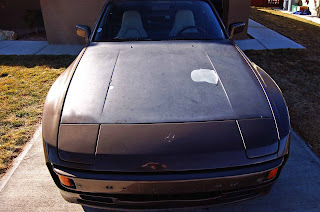 The Brown Bomber 944 was an eyesore. Sitting in the driveway with paint that was more oxidized than a 1966 Lafite left open on the counter for a week. It was ashier than Angela. It's beauty was more faded than Brigitte Bardot's. It's sable brown metallic looked more muddy river bottom. So, I picked up a very inexpensive rotary polisher. An ADT model available at many places. Than did some research at autopia and got to it. I had never used any sort of machine polisher before so it was good to practice on a junky car. Lots of stories of burning paint and leaving holograms. I think most of the issues come on newer clear coat cars. The single stage paint is much more forgiving. I started with the Meguiars M04 Heavy Cut Polish on a wool bonnet. I kept the speed at about 1200 RPMs. It was amazing how good the paint looked as the M04 polished down. The paint was smooth and shiny. I could have stopped there but I then applied Prima Swirl with a short napped wool bonnet. This product I had some issues with. Maybe it was because I used wool and not a foam bonnet? But It just seemed to gum up, although it did remove some more fine scratches. Finally, I hand applied some Klasse. The change is amazing. The paint is still a disaster with lots of chips and scratches but it looks a thousand times better. Just look at the difference in the hood that I did not work on. (this will be painted to match the wheels when the weather gets warmer). So, now that I have the equipment I can't wait to tackle some detailing projects on my 911, Boxster and wife's A6.